Now, with that out of the way . 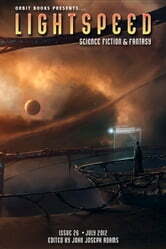 . . this month, we have original science fiction from A. M. Dellamonica (“The Sweet Spot”) and 2012 Nebula Award finalist Jake Kerr (“Requiem in the Key of Prose”), along with SF reprints by legendary authors Joe Haldeman (“Four Short Novels”) and David Brin (“The Giving Plague”). We also have original fantasy by Maria Dahvana Headley (“Give Her Honey When You Hear Her Scream”) and Aidan Doyle (“Ghost River Red”), with fantasy reprints by award-winning authors Theodora Goss (“Singing of Mount Abora”) and Peter S. Beagle (“Gordon, the Self-Made Cat”). 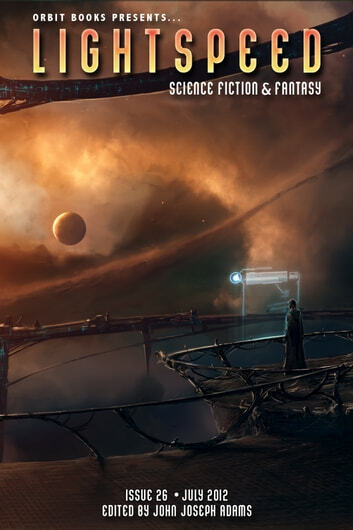 For our ebook readers, our ebook-exclusive novella is “Lune and the Red Empress” by Liz Williams and Alastair Reynolds, and we have excerpts of the exciting new SF novels vN by Madeline Ashby and Spin the Sky by Katy Stauber. All that, plus our usual assortment of author and artist spotlights, and feature interviews with physicist Brian Green and bestselling author Garth Nix.